Immediately following its big 3DS price and release date unveiling, Nintendo had on hand dozens of new titles playing on what we'd surmise is final hardware (or at least near-final, given its February 27th Japanese launch). Our first hands-on experience was just over six months ago during E3, at which point we were very impressed with what we saw. Did this playthrough garner the same excitement? Have our decidedly older but not much wiser selves become jaded by the novelty of it all? Venture on after the break to find out. The build quality of the 3DS units today were much more put-together than our last experience and definitely feel like a mass production unit. The Start / Select / Home buttons have just the right amount of clickiness, and the new analog nub was sturdy and comfortable against our thumb. The exterior is shiny but does look like it could take a beating (note: we didn't test this). We welcome the metallic stylus over the previous plastic ones, but after years of using smartphones with capacitive touchscreens to pinch-and-zoom our way around a virtual space, it's also a painful reminder of technology's past. Overall, it's the DS form factor (no surprise) that we've come to know since 2006's Lite model, for better and for worse. Familiar, yes, but perhaps just a bit too thick for our pockets. As for the screen, in 2D mode the colors stand out and it's pretty crisp, but even a slight nudge on the 3D depth slider makes for a whole different experience. The viewing angle, which we actually commend during its two-dimensional presentation, drops to single-degree acceptability when the parallax display is put to use -- moving even just a little would cause the screen the flicker and the 3D effect to be lost or too muddled to enjoy. Expect to keep your arms locked in place while playing, and we'd advise against anyone trying to look over your shoulder to follow along. What's more, there's no instruction or guidance on how to adjust the depth slider for your eyes, and each game requires a seemingly different setting, so you end up fiddling with it a lot -- to what can be quite painful results. Our own Nilay Patel has had a headache since this morning's playing session, as has columnist-at-large Michael Gartenberg. We'd suggest Nintendo require each game to pop up a calibration screen with some saved settings that disable the slider -- otherwise we can see a lot of players just disabling 3D entirely. Kid Icarus: Uprising. His first headlining game in two decades, the control scheme -- left hand on the analog stick, right hand with a stylus -- made it easy to maneuver and aim. It's essentially an on-rails shooter, fun and visually sharp, but we found it a bit harder to keep the system stable. Which means the 3D effect kept flickering in and out as we progressed through the level, to the point where we had to switch back to the more classic display. Mii Creator. Since the app boasts facial construction care of image, we were surprised just how many options we had to input before being photographed (skin tone, eye color, hair color, and hair style). Once we presented our visage, the nose and mouth it chose didn't quite seem to fit with how we've come to create or Miis, nor does it seem to pick up peripheral features like a beard or glasses. We ended up re-selecting our features manually anyway, making the camera element more a time-waster than something actually neat. AR Games. A glorified tech demo for augmented reality that's actually pretty fun. The system will come bundled with playing cards that's used as a reference point for various shooting games. There's a lot of moving around involved, and while some of the effects are fun to watch (most notably the terraforming table that undulates later in the game), it's better to think of this as a platform to imagine what could be, as opposed to something you'll spend more than five minutes playing. Face Raiders. Another built-in diversion. Take a picture of yourself or your (un)loved ones and shoot them up as you twist 360 degrees in an AR-esque shooter. It won't shake the "tech demo" vibe either, but given its free in-bundle status, we can't complain. Also helps that we spent the entire time blasting away Nilay's face, only have "boss Nilay" grow an afro upon defeat. Steeldiver. Actually one of the more interesting launch titles, since it makes use of the 3DS's gyroscope. You turn your body to locate ships through a periscope, and then you fire upon them. One of the better-looking 3D games, for sure, although the effect isn't used for anything -- it's just there. Resident Evil: The Mercenaries 3D and Street Fighter IV 3D Edition. Both games boast impressive graphics, and even 3D mode was well done -- we don't think it really added anything, but it certainly didn't distract. The games themselves were smart, fleshed-out recreations of their respective console equivalents, and the touch screen options were large enough that we could use our fingernails just fine for quickly changing weapons / activating super combos. Madden NFL. We can't explain why, but the 3D effect here was just jarring. We couldn't seem to focus no matter how we twisted and adjusted the system, our eyes ever-suffering. Overall, the visuals were markedly improved from generations past and the framerates smooth, but we're pretty sure a vast majority of our time will be kept to 2D mode. Listening to Nintendo of America President Reggie Fils-Aime's talking points today, we couldn't help but think we were caught smack dab in between its two target demographics: schoolchildren and nostalgic parents. In some ways that feels analogous to 3DS as a device. It, too, is caught between two sides of the technological spectrum. On one end, the device is burdened by a resistive screen and its dependency on a stylus -- hard to stomach in a world where it's just as easy to take a smartphone from our pockets and thumb a few rounds of whathaveyou while sitting on a train or in the back of a car. On the other end, its parallax 3D display is pushing boundaries not yet optimized for consumer use, with a trick that's only effective under very strict conditions. Make no mistake, the 3DS is a strong evolutionary step in the right direction and its catalog of titles already looking strong from the get-go -- taken as a 2D device, it's hands-down a very compelling piece. 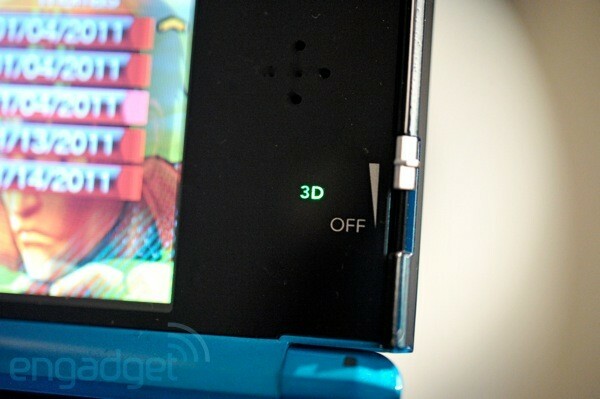 Is Nintendo pushing the 3D thing too hard? We can't wait to get some quality time on a review unit and really find out.